Author Jack Cotton has compiled a series of lessons gleaned from their canine companion of many years. The lessons Moose shares were written for children, but they will resonate with everyone who loves a dog or know someone who does. Jack Cotton is the author of several books on real estate, including the Amazon bestsellers Selling Luxury Homes, 12 Secrets Luxury Home Sellers Know, and 12 Secrets Luxury Home Buyers Know. His inspirational book A Dog’s Guide to Life: Lessons from Moose is now in its second printing. For four decades, Jack worked in the real estate company he started in his college dorm room. In 2005, Jack sold his company to Sotheby’s International Realty. Since then he has continued as a high-end agent in luxury residential sales on Cape Cod, Massachusetts. He is also a motivational speaker. A native Cape Codder, Jack can’t imagine living anywhere else. He and his family reside in a small village with a yard overrun by squirrels. Deb Hoeffner describes her unique style of soft realism” as a layering of thought, paint, and possibilities. An award-winning artist and illustrator whose work has been widely published over a 30 year career, she specializes in capturing the spirit of her subjects with expressions that tell tales. 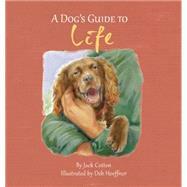 Books illustrated by Deb include All You Want And Then Some” by Carolyn McWilliams Brown, "Lucky: The Tale of a Tree" by Richard C. Hawkins, and "Forever Home: Tales of Four Lucky Dogs" by Lynn Whitman. She shares her studio in Bucks County, Pennsylvania with her dog Emma. More of her work can be seen at debhoeffner.com.